Dogs are "man's best friend." They're loyal, they're affectionate, and they make for excellent hiking companions. Unfortunately, not every trail is ideal for the both of you. Some are just too rough for them and some don't allow them to begin with. 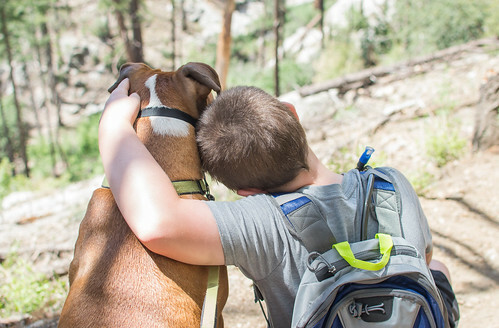 We recently posted a series of tips on how to hike with dogs that can help make hitting the trail with your four legged friend a good experience for you and Fido. We've also written up an overview where you can and can't hike with dogs around Tucson. Starting behind the Palisades Ranger Station in between mileposts 19 and 20 on the Catalina Highway, this hike begins in the pines and gradually descends into the high desert grasslands, staying well above the harsh rocky desert trails down below. Along the way, you'll pass a small spring and a seasonal waterfall before ending up at a spectacular vista overlooking the front range of the Catalinas and city of Tucson beyond. 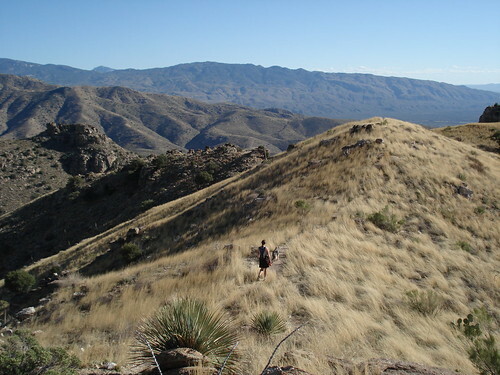 Babad Do'ag means "frog mountain" in the native O'odham language and refers to Mount Lemmon, the highest point in the Santa Catalina Mountains. This namesake hike begins across the Catalina Highway from a vista point of the same name. Although it begins in the rocky and thorny desert, it quickly rises into the more dog friendly grasslands where you'll eventually wind up atop a small hill in the middle of a ridge that provides amazing 360 degree views. 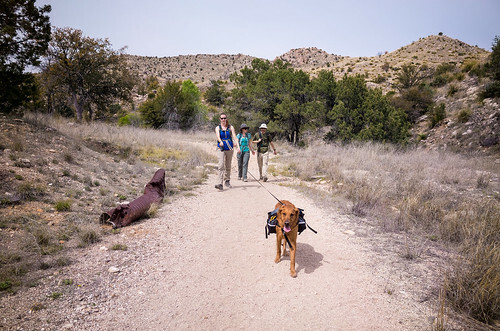 Down in the Santa Rita Mountains to the South of town, which are completely dog friendly, the Bog & Kent Spring Loop is a great option to let your dog get some exercise. The trail has a healthy amount of distance and elevation gain, it alternates from shaded woodlands to exposed stretches of trail, there are a few natural springs where you can re-hydrate, and there's a good chance you'll see some wildlife since Madera Canyon is full of it. Whether you camp at General Hitchcock campground or just park at the nearby trailhead, the hike up the Green Mountain trail to Guthrie Peak is one that you and your pup are both likely to enjoy. There are several segments of shady woodland trail covered in soft leaves and pine needles and at certain times of year there can be a good amount of water flowing in the creek bed that you'll cross multiple times. Both of you will need to be in shape for this one, and since it's fully exposed you'll want to do it when it's cool outside, but it's well worth the effort. After the first third of the ascent, which is mostly through rocky desert, the trail crosses over a stream that flows seasonally and enters the high desert grasslands, where the dirt is likely to be nicer on the paws. You'll have incredible views all of the way to the top hill up near the Gordon Hirabayashi Prison Camp, where you might be able to find water flowing in the nearby sandy wash if you time it right. 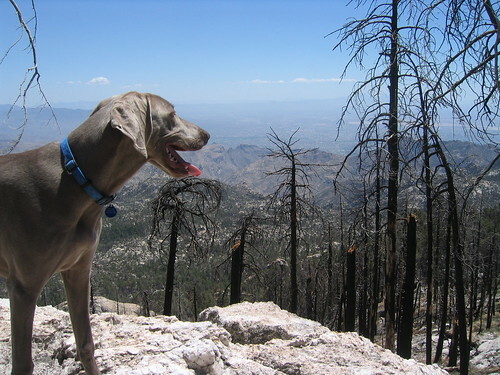 Since all of the Tortolita Mountains to the Northwest of Tucson are dog friendly, there are so many great hikes to choose from. Lower Javalina Loop makes our list because it mostly stays in the sandy wash where Fido isn't as likely to have to traverse the jagged rocks and thorny trails that make many desert trails hazardous to their pads. Your destination is the ruins of an old ranch building in the middle of a gorgeous canyon. 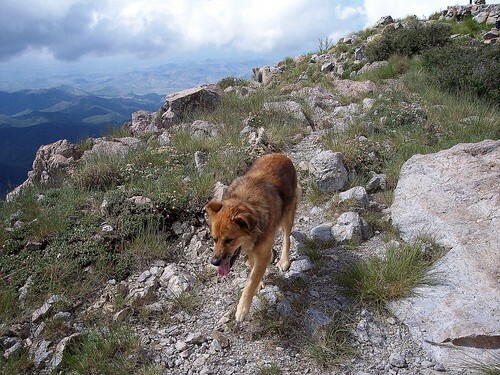 The highest peak in the Tucson area is one that you can summit with your furry friend. 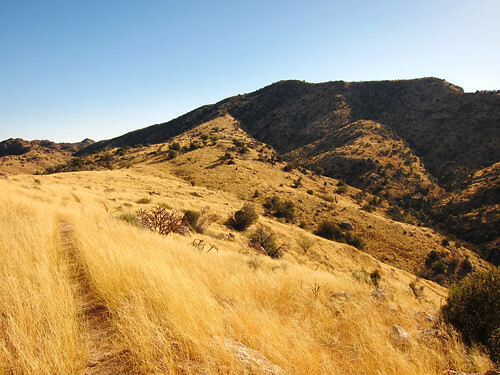 The hike to the top of Mount Wrightson down in the Santa Rita Mountains follows a beautiful trail that passes through oak and pine woodlands, as well as alpine grasslands on your way up to 9,100+ feet. This is a great hike, but definitely one that you both should work up to rather than attempting on your first time out. Something of a hidden gem right in the middle of the town of Oro Valley to the North of Tucson, Honey Bee Canyon is a beautiful and accessible place to hit the trail together. You'll be hiking mostly through dry, sandy washes as you check out the ruins of human activity in the area. On the canyon walls, you'll be able to spot petroglyphs etched by the Hohokam people who inhabited the area about 1,000 years ago. More recent desert dwellers have left their marks in the form of an old stone dam and water tanks built for flocks of sheep. 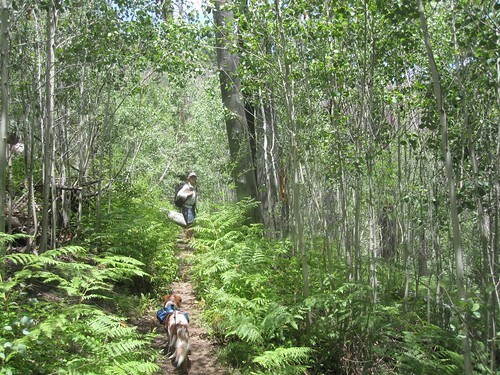 The Butterfly Loop hike will take you and your pooch through lush, old growth forests, fields of ferns, new growth aspens coming back after the 2003 Aspen Fire, oak woodlands, and grassy alpine mountainsides, all up at around 8,000 feet. This trail, up near the top of Mount Lemmon, even features natural springs and an old Air Force jet crash. With or without the dog, it's one of the best hikes around. The Agua Caliente trail is one of the few places where you can take your pup on a hike without having to drive far from the city. Even though it's accessible, there are several stretches that make it hard to believe there's almost a million people living nearby, like the grassy ridge walk near the peak of the hill. Dogs are a common sight on this trail, so be sure to keep yours leashed. And if you forget to bring a bag to clean up after Fido, the trailhead dispenser is usually well stocked. 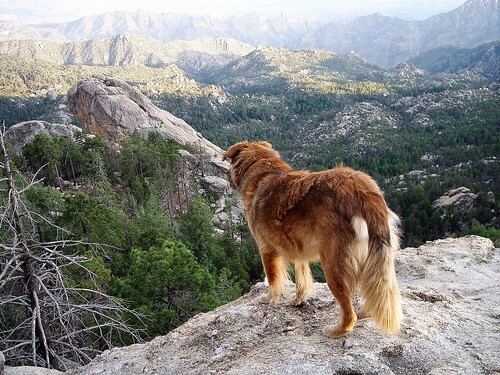 For a quick and cool hike that you and your canine companion can enjoy, look no further than the Meadow Loop up at the very top of Mount Lemmon. There are only a few brief stretches where the trail is noticeably rocky, but otherwise it's heavenly grass and pine needles as you trek through a mountain meadow and old growth forest up at elevation. 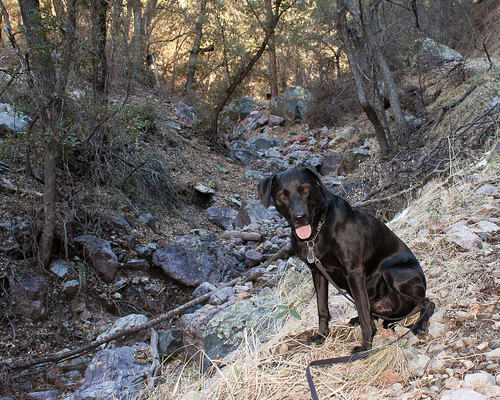 Another hike down in the Santa Rita Mountains to the South of Tucson, the out-and-back hike to Dutch John Spring is a pet friendly romp through oak and juniper trees to an old concrete tank that catches water from a natural mountain spring. It's a great hike to do with the dog if you're not looking to be out all day. Starting near the top of Mount Lemmon, off of the Catalina Highway at around 8,000 feet, Box Camp descends through young woods recovering from a burn and serene patches of ferns growing along a seasonal stream beneath tall pines to an amazing little rock that overlooks all of Sabino Basin, as well as the city of Tucson further out. The shade, the stream, and the wildlife are all sure to please your pup. The terminus of the Catalina highway is a popular picnic area known as Marshall Gulch. From the nearby trailhead, you can set out to complete a 4 mile loop in either direction you choose. Whichever way you go, you'll be hiking through a green tunnel of aspens as well as young and old growth forest alike as you skirt the edge of the Wilderness of Rocks and criss-cross back and forth across a mountain stream. If that doesn't sound like puppy paradise, we don't know what does. When you're ready to spend all day on a mountain trail with your best friend, look no further than the Wilderness of Rocks. This loop trail will have you hiking along the top of Mount Lemmon and through a geological wonderland not far away, where you'll find fascinating hoodoos all over the place. Amazing views, mountain streams, and cool pine patches are also found on this incredible hike. Unfortunately, the super popular Romero Pools hike is off limits to dogs because it is well within the boundaries of the Bighorn Sheep Management Area, but there is another great hike up in Catalina State Park where Fido can still have plenty of fun. This loop hike stops just short of the sheep boundary and you can often find a good amount of water for you pooch to play in after a good storm. This hike has it all. Soft dirt instead of jagged rocks, cooler weather at a higher elevation without the long drive and frigid temperatures at the very top of the Catalinas, history, shade, water, and ruins. The out and back hike from the Gordon Hirabayashi Prison Camp to the dam that provided the internment camp with water is a fantastic place to take the dog for a day out on the trail. Do you agree with our list? 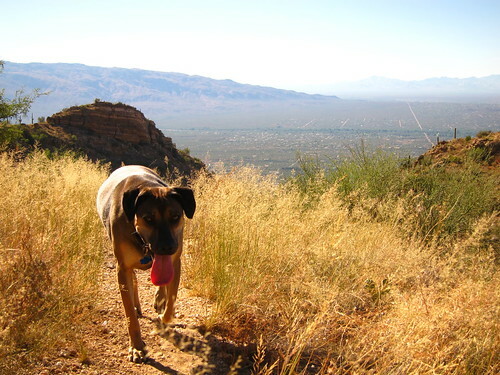 What are your favorite dog friendly hikes in Tucson? Tell us your thoughts in the comments below. Good article. But it would be better if in future you can share more about this subject. Open a bag of VitaLife Natural Diets TM dog treats, and you will immediately smell the difference. At VitaLife, they make treats that taste as good as they smell. VitaLife dog treats come in different textures and a variety of flavors, so go ahead explore the deliciously healthy world of VitaLife for your dog! Hi friends, fastidious article and fastidious arguments commented at this place, I am in fact enjoying by these. 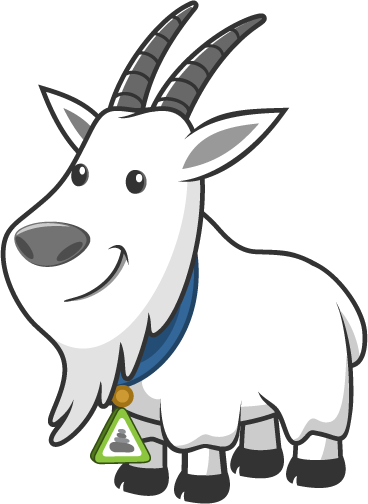 This is where the Trailvoyant team will be posting things like lists of the best local hikes, articles with helpful tips for the trail, stories from our adventures, and updates on our progress to build the best hike planning tool possible. © Trailvoyant, 2016-2017. All rights reserved.. Awesome Inc. theme. Powered by Blogger.